What makes you interesting? How do you create value? Are you doing anything that will make yourself stand out from your competitors? If so, you are probably using social currency. What is social currency? It’s basically your influence and presence on social networks and offline and the degree to which your business is shared by your customers. You provide information to others and that helps define your identity through social channels. All businesses use social currency, and for a good reason. Turns out putting your best foot forward is a great tactic in connecting with your customers. When you share jokes and interesting things with your customers, those messages are likely to be shared. Which results in not only brand awareness, but it also creates a better bond between you and your customers. They like you because you are cool, and they like sharing cool things with their friends. You see how this works? Social currency means you are basically telling everyone what makes you better than the rest. Put yourself out there, you share a joke here and there, talk about your best features. You’re basically making yourself date-able, trusted, relatable...you get my drift? You don’t have to dive right in, play it calm, cool and collected and build your relationships up. Becoming a friend of your customers by sharing funny, interesting and cool things about yourself helps you develop these relationships. It also helps to interact with customers. So if someone tweets at you, reply back. Social currency is the key to everything you have ever seen go viral on the web. Now that isn’t saying everything and everyone goes viral, but it does help you increase your word of mouth travel… we all know word of mouth marketing can make you popular. Do you need some examples of how social currency is put into play? Perfect, thought you’d never ask. Talk about awesome. If I could start earning money by joining an affiliate program like Amazon Associates, why wouldn’t I? I’d tell my friends about it because it’s just too cool not to share. 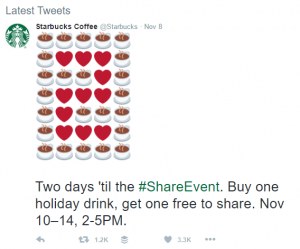 Yes, this Tweet from Starbucks is #perfect. As you can see they made a fun little countdown number (2) with hearts and coffee cups – cool visual to share, right? They created a limited time event, which creates a sense of urgency and exclusivity. You don’t want to miss out on sharing the love. Do you see a number of shares and likes? Buy one and get one free (for a limited time) definitely work in fostering a lot of shares. Okay, referral programs are great in that all of your customers know at least one other person who would love you. Trendy Butler gets that. 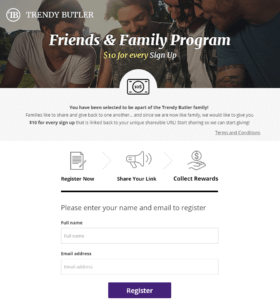 See how they call it a Friends & Family Program, it makes it sound like you’re on their exclusive list, plus they make you feel like you’re family. Who wouldn’t want to share? As shown above, social currency doesn’t have to be specific to one thing in your brand. Whether you use it to promote a promotional item, your referral program or just your brand in general – be creative, have fun, show who you are and you can have great social currency.